If your Panama trip is limited to Panama City, you may want to fit in a visit to a nearby beach. There are a few within a two hour drive, but we didn’t want to rent a car for a day or do a full day tour. Instead, while we were having breakfast one day during our stay, another person at the same event told us about Taboga Island. We decided to check it out later that day. 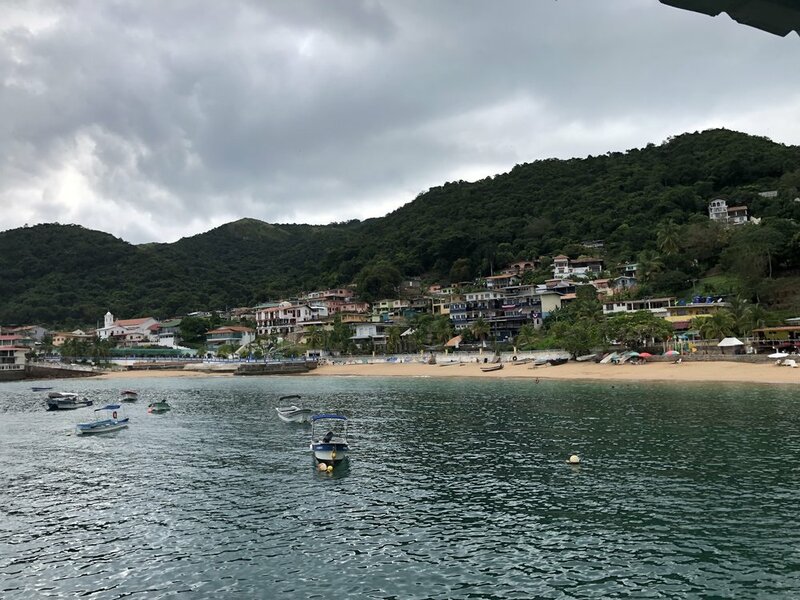 There are several ways to visit Taboga Island, and since it was a little tricky to figure out on the fly, we wanted to share how we did it to save you the hassle of figuring it out. One note, though: Panama is home to well-known beaches (as well as rainforest), so if you are planning to visit other parts of the country, you probably won’t want to spend your time at the beach from Panama City. On the other hand, if you want a relaxing afternoon beach destination, Taboga Island is just eight miles (30 minutes by ferry) from Panama City and is easy to get around on foot. (The entire island is only eight miles in perimeter.) Beyond a nice beach, Paul Gauguin visited the island for malaria treatment on his way to the South Pacific and it is home to the second oldest church in Latin America (San Pedro Church, built in 1524). First, take an Uber to Fuerte Amador Mall on the Amador Causeway. When you arrive, you’ll see a convenience store (labeled “Duty Free Store”) where you can pick up water and snacks before you board the ferry. Then, head to the ticket office for the Taboga Ferry. During our visit, tickets (in the form of wristbands) were being sold from a table behind the building, but we were told that arrangement was temporary. Only cash was accepted for the $20 per person round trip tickets. You can see the ferry schedule on the website, and will be asked when you buy your ticket which ferry you want to take back from the island. The return time is then written on your wristband. We were able to take an earlier boat back when a sudden storm popped up, but you may not want to count on there being room if you decide to take a different boat. The ferry boarded on time, and we were lucky to be able to sit in the front outdoors. 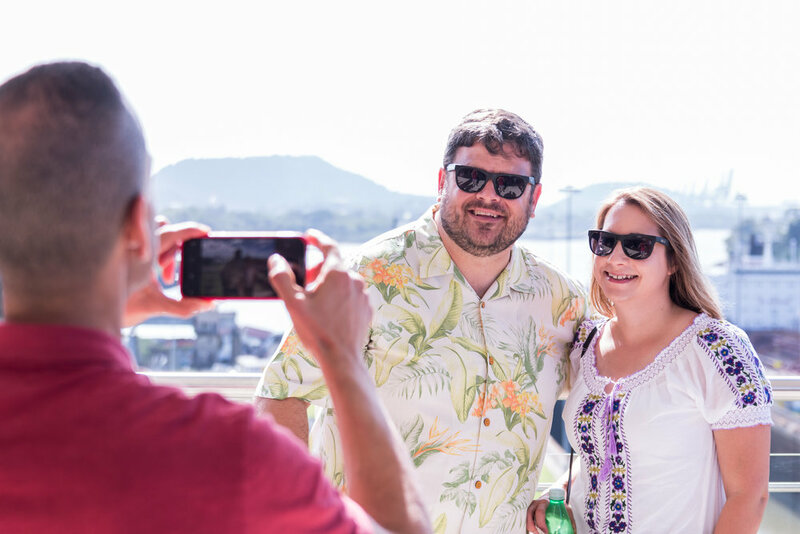 We were able to see ships traveling through the Panama Canal, and snacks and beverages were available for sale. When you arrive at the island, turn right as you walk off the dock to head to the beach. On the way, you’ll pass some takeaway restaurants, and places where you can pay to use showers and changing rooms. Or turn left to if you’d prefer a sit down restaurant (see below). 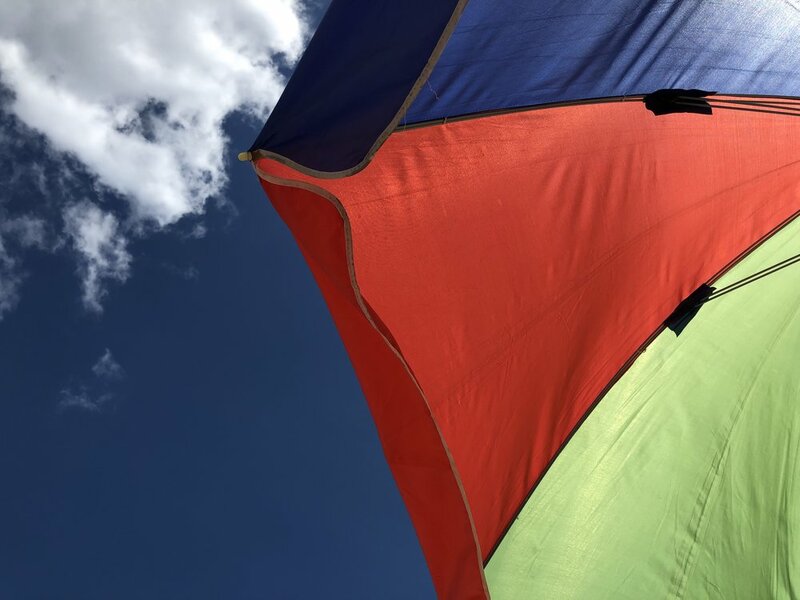 At the beach you’ll find some chairs and umbrellas, or if you just stand there for a moment, you’ll be approached by people renting chairs and umbrellas. The prices are for the whole day, but are still modest even if you’re just there for a couple of hours. (The cost for two chairs and an umbrella was $15 with tip.) Do be sure to bring sunblock, as options to buy sunblock on the island are limited. While Google Maps will tell you there are no close ATMs, there is a Banco Nacional ATM. Reality check: When we realized (after we arrived) that we needed cash for almost anything on the island, and then saw that Google Maps showed no ATMs, there was a moment of, shall we say, concern . . . . Then we saw a police officer coming out of the small police station and asked if he knew where we could find an ATM. He paused, scratched his head, and said “Hmmm.” After he made us sweat a moment, he broke out in a wide grin and walked us around the corner to the ATM on the side of the police station building. If you can, definitely get cash before you head to Taboga Island. But if you find yourself there and in need of cash, turn left as you walk off the dock and start up the hill. (It’s on the way to our recommended restaurant.) When you see the small white police station building on your left, walk past it and you’ll see the ATM on the side of the building farthest from the dock. We only ate at one of the island’s six restaurants, but enjoyed both the food and the service at Restaurant Calaloo. The appetizers (save yourself time and just get the ceviche for $6 — it’s delicious) and entrees ($10-14) that we got were all good. (The fish and chips were good, but the fish tacos were excellent. If you’re visiting an island with a name that means “abundant fish,” you might as well get the fish.) To get there, turn left after you walk off the ferry dock and start up the hill. Restaurant Calaloo is the brightly painted building on your right after you pass the police station. Reality check: While the food and service were both good, the company was, shall we say, not the finest America has to offer. The group of four American men was very open and direct about that fact that one woman with them was one “gentleman’s” girlfriend, while the other three women were being paid for their company. The group was so loud, rude, and just plain gross that several people who entered the restaurant and heard them turned around and left. We had already ordered and felt bad for the staff, so we stayed and stuck it out. The ceviche and fish tacos were delicious, but the company left a lot to be desired. Presumably, this is not something you’d encounter on your own visit, but it was a memorable part of ours. Another option for an inexpensive meal is to ask the ferry staff where they get their lunch. (There is a break between ferries while the staff eats lunch from one of the takeaway restaurants to the right of the dock.) The ceviche from that restaurant was just $3. If you’re looking for an amazing beach experience, head outside Panama City. But if you just want a relaxing afternoon at the beach, Taboga Island is easily reached and can be a nice break from the more crowded city.